If you think you’re too small to make an impact, try going to bed with a mosquito. CITY ARTS NASHUA: ARTVENTURES will take the public on a dramatic series of collaborative public artworks transforming Main Street and downtown Nashua through the celebration of identity, ethnicity, history, industry, urban revitalization, creative economy initiatives and quality of life concerns. It’s facilitated more outdoor displays than perhaps any other art organization in New Hampshire, from the Nashua International Sculpture Symposium, bringing in handfuls of sculptures downtown every year, to the Vivian’s Dream and restored Yankee Diner murals, the latter of which was refinished by former New Hampshire Artist Laureate James Aponovich this fall. But all these projects have been permanent, artist-commissioned work. Very few were participatory projects. That’s where Jerry Beck comes in. Beck has a 30-year resume in producing participatory, temporary public art projects. He founded The Revolving Museum (TRM) in 1984 and has transformed railroad cars, Civil War forts, textile mill factories, baseball fields, movie theaters, ice cream trucks and old warehouses into venues for visual, theatrical, literary and public art projects in Boston, Lowell and Fitchburg, Mass., where he’s currently the city’s director of economic development and chief marketing officer. But for the past several months, he’s been working on Nashua. 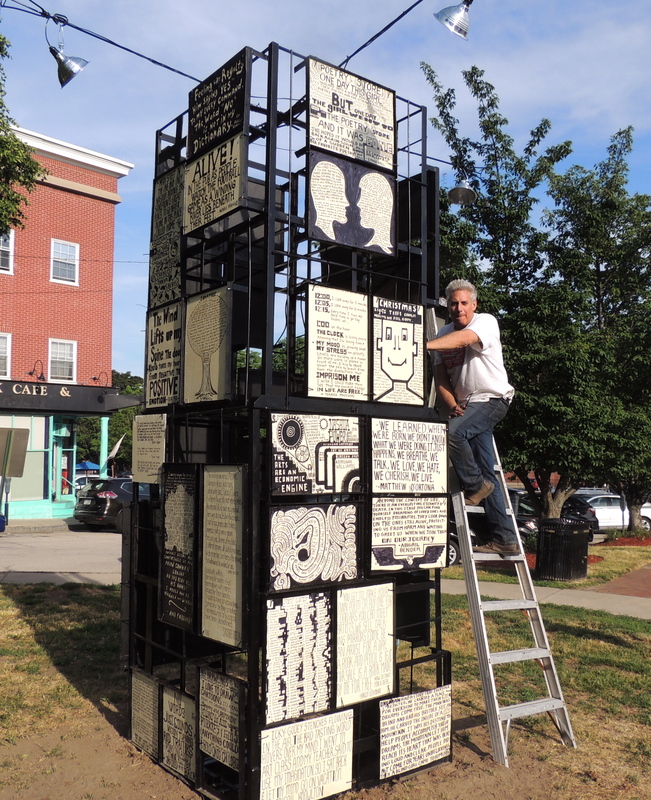 At the center of downtown Nashua stands a tall structure decorated with about 60 poems. It’s located between Main Street and the Riverwalk Cafe and Music Bar, where the Christmas tree usually stands during the city’s annual Holiday Stroll, and it’s covered in wooden panels with pieces written in different styles and texts. Themes touch on memories, time, jealousy, war, home, death, loneliness, anxiety, poetry and the imagination, and many poems are accompanied by black and white sketched illustrations. They were all written by Elm Street Middle School students this spring — but try not to act too surprised. “I don’t think a lot of people [realize] what kids our age are really capable of,” said Teraysa Majewski, a 14-year-old eighth-grader from Elm Street Middle School, during an after-school celebration with the school’s photography and writing club, facilitated by art teacher Karen Munz and English teacher JoAnne Del Greco, respectively.